The newest character (yet to come to NAGC). She was reccently released on the brazilian server and she'll be a starter character for them, as it was the brazilian community along with the game developers who made the character. 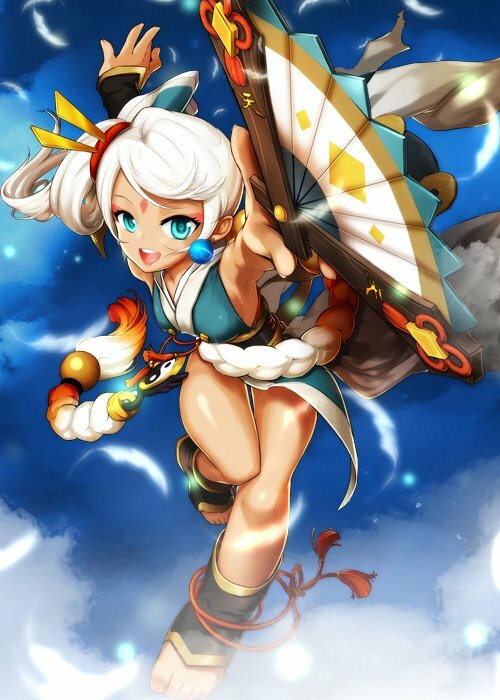 So far it seems she'll have a deccent mobility (unlike Arme), her 1st job is related to wind based abilities and she uses what seems to be a fan. Special mechanic: From what I saw in a livestream, whenever you use an ability a combination will show up in the screen, no sure if you miss it'll do less damage or cancels the ability or just do extra damage along with an added animation (similar to Sieghart's JF). Her normal combo (z z z ...) is similar to Mari's 1st job dash attack where she makes this mini tornado, except Lin just spams tornados and is able to juggle enemies endlessly if done right. Finally, she also has a shadow move/shadow dodge, for those who aren't familiar to the term, she can basically use a dodge movement similar to Elesis' 3rd job (press a specific key during your combo and she'll literally slide to the other side of the enemy). I like the way she looks, it's just very "seen it before", looking. But she sounds like a spin off of Arme mixed with some Mari. So, should be interesting. We know we won't be getting her for some time, since Dufus is still a new release. Well it deppends, Rufus was also kinda recent in the BRGC, but then again they were the ones who made Lin, so probably in a month...or 2, we'll have her here. She reminds me of Mai Shiranui from The King of Fighters series. Although there's some differences between the two in terms of appearance and clothing. Still looking forward to see how this character plays though once NAGC has her.